I always thought it seemed like a waste of space as it was not very inviting, and I didn't want to store anything right on the gravel floor and risk any musty smells. But this system keeps everything off the floor. This works in a Crawl Space Too! Keeps things off the floor. ​We had a 4 foot tall crawl space in our last house, and there are ways to store your things. If you want to keep them off the ground and you have a little bit of height, the above systems works as you can attach them to the floor joists and keep your things off the floor where there may be some dampness. Even just a few inches off the floor will keep musty smells out. But I did discover creative ways to utilize the space to keep the rest of the house clutter free. There are many products on the market now that will help you find creative ways to store seasonal items and things you don't use all the time. Attic storage is another great place to store things if you use the right products. Also above the garage, you can hang storage shelves. Every crawl space is different. There are just as many styles of crawl spaces as there are houses. Some have some height and others are crawl in only. 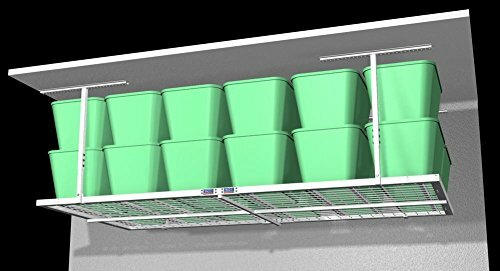 If you have at least 4 feet, you can suspend this rack from the above floor joists to use as storage and to keep things off the ground. Even if they are only a few inches off the ground it stops your storage items from absorbing moisture. You can use the same systems that are used in the garage as they attach to joists above too with the added bonus that usually you can see the floor joists in the crawl space as they are not usually covered or dry walled..
As you can see in the picture, this rack would attach to the floor joists above which in the crawl space are usually exposed making it easier. You can then store your seasonal things and keep them off the floor. Even just a couple of feet in height means you can utilize this area for the best. Depending on the type of flooring in your crawl space, you can build up moisture which can cause odors that will affect things you store down there but can also work their way up to the main floor. Quite often the floor above is not sealed or insulated against this space, so any moisture or odors will work their way upstairs. By investing in a professional humidifier, you can get rid of damp and musty smells. This one is designed specifically for the crawl space. 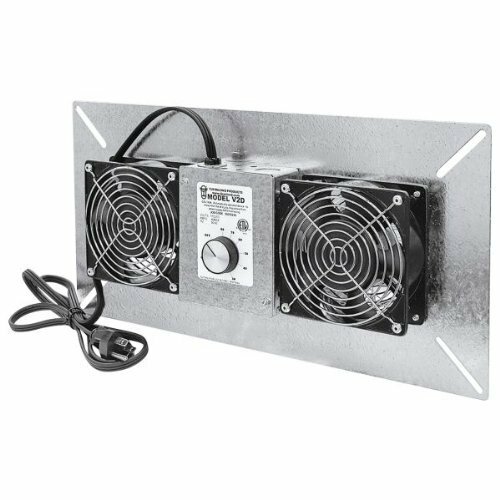 Crawl Space Vent - Specifically designed for the crawl space, this ventilator will move that stale air to keep the space ventilated which in turn will stop musty odors from heading upstairs. If you want to utilize this space more for storage, you should try and keep it ventilated and dehumidified as best you can especially if you have a gravel or dirt floor. Crawl Space Vapor Barrier - Lining your crawl space with this type of barrier will help to keep the moisture down but this one has the added extra of termite control. Below is a video on just how moisture barrier can be laid in your crawl space, especially for those dirt and gravel floors. Obviously remove things that shouldn't be down there, such as old cans or debris or bits of wood, and then lay this barrier out and pin it in place. 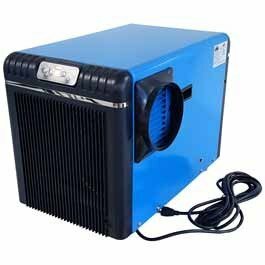 You may find the dehumidifier doesn't have to work as hard and with the fan ventilator you can totally change this space into something more usable, especially for storage. This is great if you are getting tired of walking on sand, dirt or gravel. This barrier is pretty tough. Then hang your shelves on the floor joists above and they won't smell musty. I like to store things in totes, but sometimes that is not possible, and you don't want that stale smell to permeate your things. Cover the floor, get the moisture out and ventilate and you will be surprised just how much better the air quality will be in this space. It all depends on the uses you want for this space. You can invest a lot of minimal. But back to the crawl space. If you would like to use that area, then the first thing you need to do is use products that will keep your things dry and musty free, and the best way to do this is to keep things directly off the foundation floor, whether it is gravel, dirt or rocks, it can hold dampness and that can be transferred to your stored items. The above shelving systems works well as it is screwed to the above floor joists, and you can do the same in your basement by screwing the system to the floor joists (ceiling of your crawl space) as long as you are not using a lot of weighted items. This is the perfect system for seasonal decorations and clothes for example. If you must store on the floor use plastic tubs with a good sealing lid. Crawl Space Hatch - If you have a crawl space with a tiny entrance whether on the inside in the floor or the outside of your home, the size of the opening is definitely going to control how much you store! ​You can replace or upgrade your crawl space door to a size that is more comparable to the totes and boxes you want to fit in that opening. The above is a standard size but you can get larger. This will then open up that area for storage. The walls of the crawl space are also another great place to attach storage solutions. The trick is to keep things off the floor the best you can. By attaching sturdy shelves to the walls, such as the ones pictured you will now have access to many square feet of storage and get your house clean and organized. If they are air tight with the clip lock style lids, then you can stack them directly on the floor. They are clear so you can see what is inside each one. Crawl space storage is perfect for seasonal items and even extra canned or packaged food. I have always found them to keep things clean and dry. This single fold down shelf is perfect for the walls of your crawl space. Once attached to the wall you can place your tubs on it for storage. You could get a few of these and line the perimeter of your house or space and not only have your items off the floor but if you put them in tubs as well they will always be musty free and easy to find. When not in use it can simply be folded back against the wall. These are very strong. If you are renting or you just don't want to get into any DIY of attaching shelves to ceilings or walls, here is a quick solution. Get some concrete blocks or bricks and stack them on the floor and then put a plastic shelf, or painted wood shelf (seal it so it doesn't absorb any dampness) and then place your tubs on the shelf. This keeps everything off the floor so that moisture doesn't build up and there is some air flow. Obviously it is best if you don't totally fill this space with useless stuff. If you haven't used it or looked at it in a year most likely it can go. Then drag everything out and create 3 piles for "garbage" and "Keep" and Donate" and Even a 4th pile for "sell" if you want to have a garage sale or sell online. If the idea of heading down there makes your back cringe, then hire someone to drag the things out for you. Once sorted you can hire them to put it back for you. Finding creative ways to store things in your house? Trying to make this the year of getting organized? Then don't forget your attic or your crawl space. These are areas that are just waiting to take your seasonal items and other storage needs. 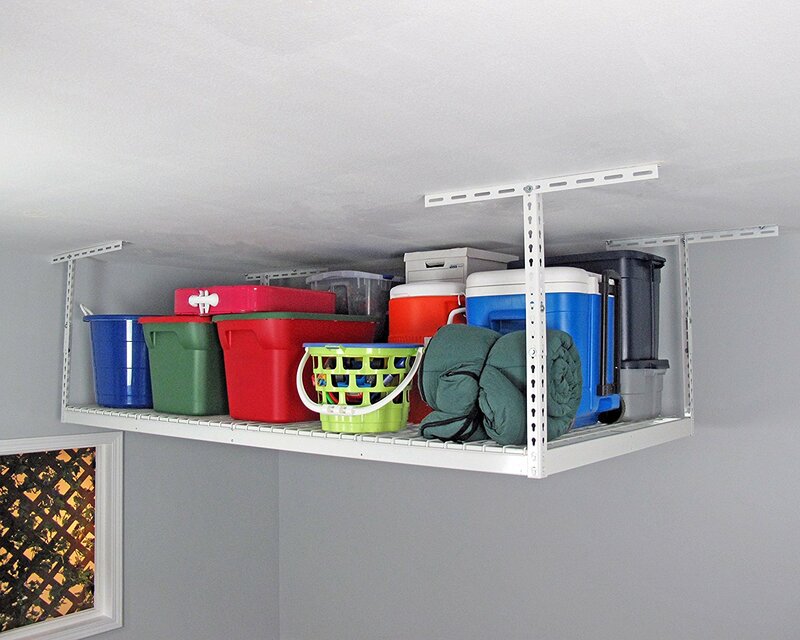 Crawl space storage is an affordable way to get organized this year. Many crawl space floors are not even or maybe even dirt, so using the walls and the above floor joists to create storage shelves are your better option as you don't want heavy shelving units tipping over if they are on uneven ground.